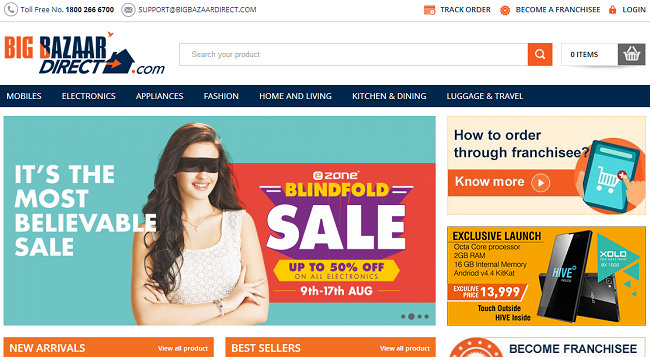 Future Group launches Big Bazaar Direct e-commerce store; what's on offer? Future Retail Ltd, which houses a string of retail chain formats, has launched the business-to-consumer (B2C) portal for Big Bazaar Direct. With it, the company aims to create an e-commerce enabled direct selling business for its flagship hypermarket Big Bazaar. The online store is basically a direct selling platform that enables customers to place orders with the company's franchisees (retail stores or kiraana outlets), post which they will receive their orders in three-seven days. Earlier this year, the group had launched its franchisee model retail format under the branding of Big Bazaar Direct, and is targeting 50,000 franchisees by the end of 2014. Accessible on Shop.bigbazaardirect.com, the site currently offers products in a seven categories that include mobiles, electronics, appliances, luggage & travel, home & living, kitchen & dining, and fashion. Users can also search for products via a dedicated 'search bar', and filter them according to their category. However, instead of offering a regular e-commerce site, the company has added a twist to it. For placing orders, users will need to log-in to the site and enter the details of their nearest 'franchisee' while placing the order. Every Big Bazaar Direct franchisee is issued a unique franchisee code, and customers can buy products only if the franchisee has shared his/her code with them. Note that the franchisee code is only for reference to link your order with Big Bazaar's franchisee, and should not be treated as any discount code. Visit franchisee: You can physically visit a franchisee, place the order and make payment, post which Big Bazaar will deliver the products at the address provided. Book online & pay at franchisee: Users can place the order online using Big Bazaar Direct franchisee code, post which they will receive an order booking SMS from Big Bazaar Direct. They can then visit the franchisee and make payment to confirm the order. Once paid, goods will be delivered at the address provided. Direct online payment: Users can place an order online (will require franchisee code) and pay for the same using the company's online payment options. Once the payment is completed, they will receive an order confirmation SMS from Big Bazaar Direct, and the goods will be delivered at the address provided. Last we checked, the company was offering franchisees in 33 cities in the country that include Ajmer, Alwar, Bhilwara, Udaipur, Faridabad, Firozabad, Ghandhinagar, Ghaziabad, Gurgaon, Hyderabad, Jaipur, Jodhpur, Mumbai, Nagaur, Pune, New Delhi, and Noida, among others. Note that while order for food products below Rs 1,000 cannot be fulfilled, shipping of non-food products below Rs 500 attract a shipping charge of Rs 50. Also, on some products shipping charges are applicable and the same is specified on their 'Product Description Page'. For deliveries, Big Bazaar has partnered with companies like BlueDart, FirstFlight, GoJavas, Tanvi, and FSC. Launched in September last year, Big Bazaar Direct enables wannabe entrepreneurs or direct sellers to sign up by filling a franchisee application form on BigBazaarDirect.com, after which they will need to send their Know Your Customer (KYC) documents and an application fee of Rs 1,000. For sealing the deal, an investment of Rs 3 lakh will be have to be made by the franchisees that includes Rs 1 lakh each as non-interest bearing refundable security deposit; initial advance that is to be used for placing orders; and set up charges for Big Bazaar Direct tablet, initial branding, one year training, and launch material, etc. In addition, franchisees don't need to stock and deliver goods; Big Bazaar will handle the same. The company will also provide a dedicated team for franchisee and customer support; in case of any product related issue, Big Bazaar Direct will arrange for the return pick up. Franchisees will get a cut of every order placed via their tablets. With pure play online retailers like Flipkart, Snapdeal and Amazon fighting it out for supremacy of the e-commerce market in India; it would be interesting to see if Big Bazaar's offline to online play can make a niche for itself. According to the company, the major USP's of its platform is the availability of fast-moving consumer goods (FMCG) products and the delivery time for the orders. The firm can also potentially retain its regular customers who currently drive to the stores once a month for shopping. Big Bazaar stores already faces a challenge, especially during the weekends, with rush at the payment counter and the new venture could possibly try and build revenues without generating as many physical foot-falls to its hypermarkets. According to the company, it currently has around 250 stores across 93 cities in the country, which catered to more than 25 crore customers in 2013. There are players like AaramShop, BigBasket, ZopNow, MyGrahak, LocalBanya and Ekstop which offer online interface for ordering products similar to Big Bazaar.